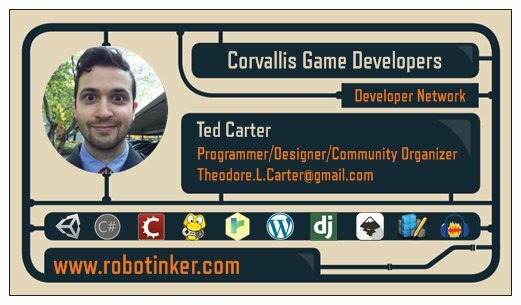 Plus, Corvallis Game Developers is now on Twitter, Facebook, and Meetup! I put together a Wordpress site to tie all those together and harmonize the calendars and posts: check it out! We're having a game jam in two weeks, which I'm helping to organize as well! Much excite. Making a Visual Novel Engine? After getting absolutely fed up with a particular game idea during a jam, I somehow ended up sinking 3 weeks into working on a visual novel engine in Unity. I've definitely learned a lot more about UI design and implementation, and am focussing on the twist - what if visual novels were multiplayer? Have you ever watched someone play a non-linear narrative just because you enjoyed the story, or had a loved one watch one while you played? I'm wanting to make a platform wherein up to 4 people can influence the story in a variety of ways. Core functionality is done, now working on some polish and usability stuff before embarking on a content creation campaign! Doing some play testing of the tech demo tomorrow as well so very excited to see how people respond.